The Honda Ridgeline is back, and it's better than ever! 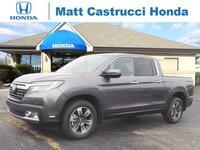 Matt Castrucci Honda is proud to introduce the 2017 Honda Ridgeline. With a clean new design and a literal truckload of convenient features and technology, the 2017 Ridgeline is ready to push the boundaries of what a pickup truck can do. In some respects, it's very similar to the 2014 Honda Ridgeline. Like the older model, the new Ridgeline is built to ride more smoothly and handle with more agility than the other midsize trucks on the market. The 2017 Ridgeline also shares the 2014 Ridgeline's most unique features, such as the swinging tailgate that can open in two directions. But there's a lot that's brand-new, too. Side by side, how do the 2017 Honda Ridgeline vs 2014 Honda Ridgeline really stack up? Let's find out! Starting under the hood, the 2017 Ridgeline comes with a new and improved version of Honda's powerful V-6 engine. This new engine boosts the 2017 Ridgeline's maximum horsepower to 280, compared to the 2014 Honda Ridgeline's 250. It also gets better gas mileage than the first-generation Ridgeline did. *Based on 2017 EPA mileage estimates. Use for comparison purposes only. Your actual mileage will vary depending on how you drive and maintain your vehicle. We've already mentioned the dual-action tailgate that was one of the old Ridgeline's most defining features. Another was the lockable in-bed trunk, which provided even more storage room and a secure space to lock up valuables. The 2017 Ridgeline improves this feature with a flatter floor, and adds a removable drain plug for extra-easy cleaning. And, of course, there's the world's first built-in truck bed audio system, introduced for the first time on the 2017 Honda Ridgeline. Imagine turning the whole truck bed into one big speaker! The 2017 Ridgeline is available with a brand-new Apple CarPlay and Android Auto-compatible audio system. Finally, it adds the full suite of Honda Sensing driver assistance features, making it one of the safest new trucks around. 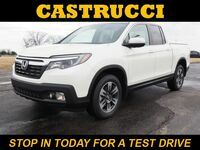 Interested in learning more about the 2017 Honda Ridgeline in Dayton, Ohio? We're happy to help! 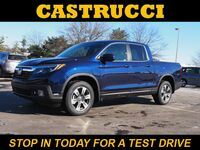 Contact us online, call 855-250-8986 or stop by Matt Castrucci Honda to test drive the brand new Honda Ridgeline today!